Agents E and C continued with their last major assignment, a reconnaissance mission to scope out the markets and wildlife of central Thailand. 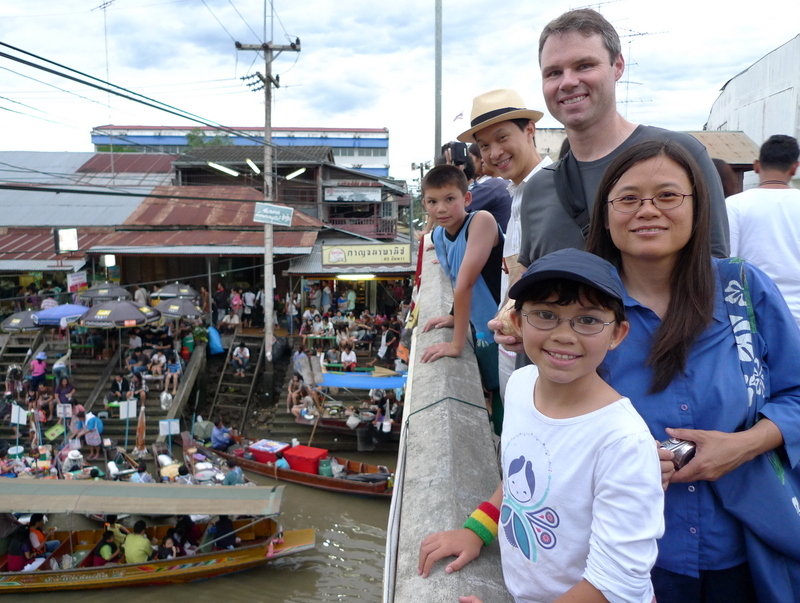 Their destination: the Samphran Elephant Grounds and Amphawa Floating Market. 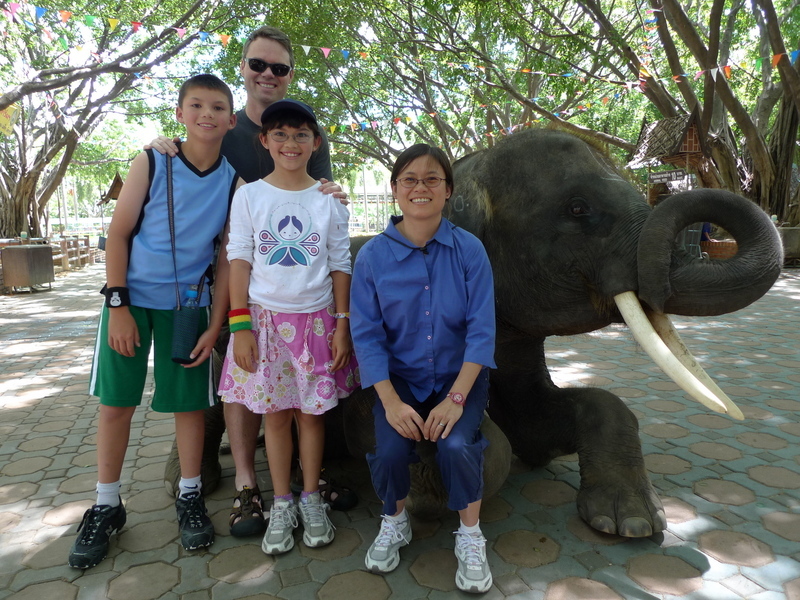 We drove about an hour west of Bangkok to Nakhon Pathom province, home of the Samphran Elephant Ground and Zoo, a popular sightseeing stop both for foreign visitors as well as Thais. I guess we could invite the animal rights experts to debate the merits of this type of attraction, in which elephants and other animals are on display and put through their paces in shows. The upside is that it gives people a chance to interact with and, hopefully, appreciate these creatures and why it is important that their habitats be preserved. Agents E and C didn’t have any particular assignments at this first stop, other than to feed the elephants. It is easy to be awed by how strong and how smart these animals are. They are also very playful. One of the adults liked dancing in her pen to the rhythm of the music playing from the magic show in the nearby stadium. 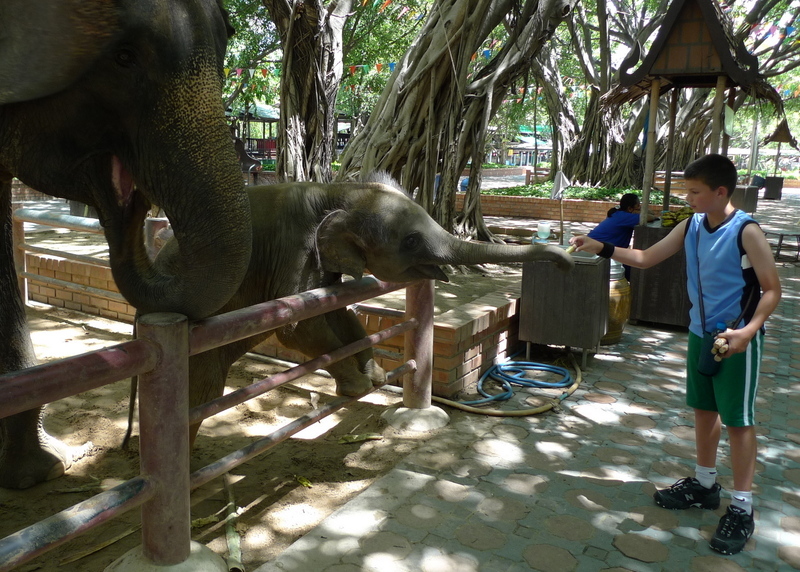 She was doing this on her own, with no guidance from her mahout, or trainer. …but I think she got a little “carried away” by the baby’s mother! A unintentionally psychedelic photo when I had the wrong setting on the camera and twisted it while taking the picture. One of the babies (nine months old, in fact) hoped to borrow my camera. 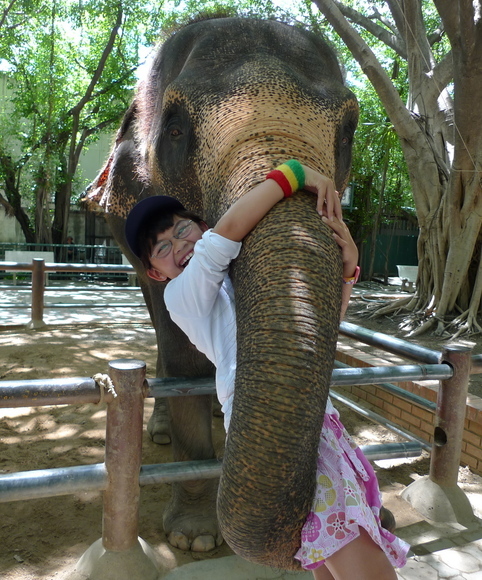 Even Tawn got into the act, getting a big hug from one of the elephants. 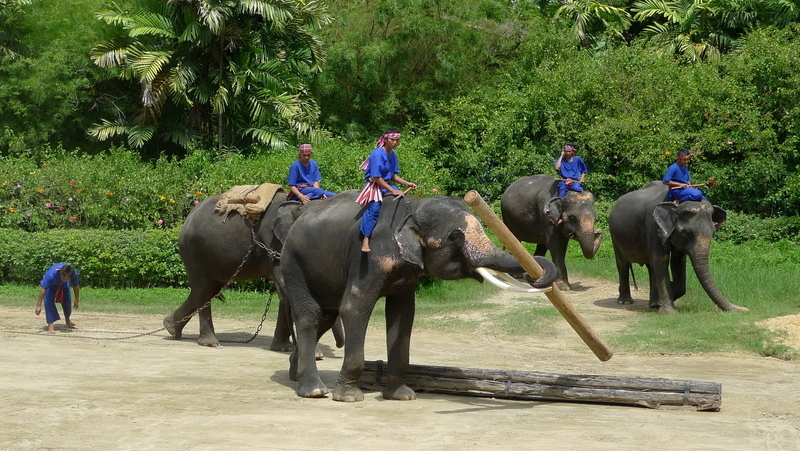 In the elephant show, we learned about the history of elephants in Thai culture, including their use in logging, an occupation that is pretty much extinct, leading to the problem of too many elephants and too little designated land where they can roam wild. 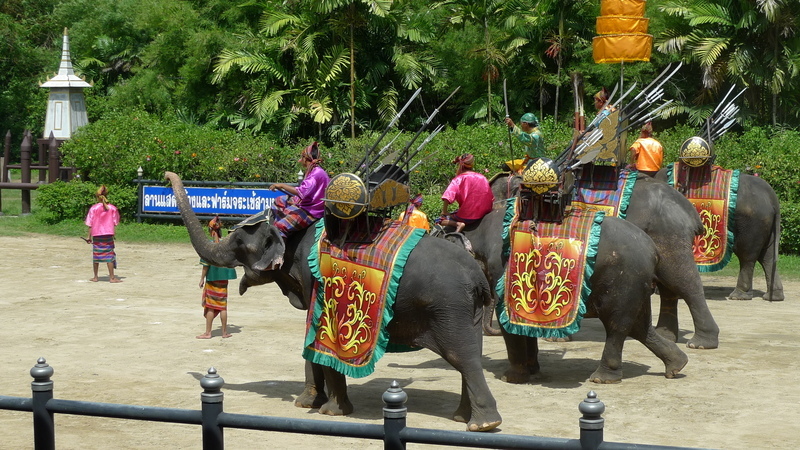 We also learned about elephants’ role as weapons of war, featuring a silly little skit complete with low-tech pyrotechnics to simulate the Thais’ victory over the Burmese. Actually, at that point in history it would have been the Siamese’s victory. One of the biggest lessons I’ve learned from Agent E and C’s visit is that it is the small things that really provide young people with the most fun. 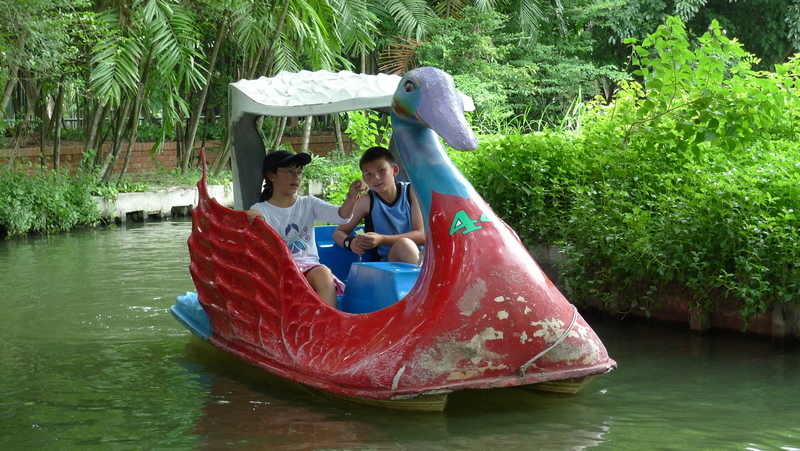 A half-hour spent paddling around the lush landscaping in an aged paddle boat provided an adventure for them and a respite for the adults. The swan looks like it has had some plastic surgery, maybe a beak job. After the elephant grounds, we hopped into the car and drove through a small rain storm on our way to the floating market in Amphawa, Samut Songkhram province. Along the way we stopped at a roadside cafe that I used to frequent in the days when I volunteered as an English teacher in this province, so as to enjoy several types of fried rice. Because there were a lot of other events going on this weekend (including World Cup) the market was busy but not overcrowded as sometimes happens. 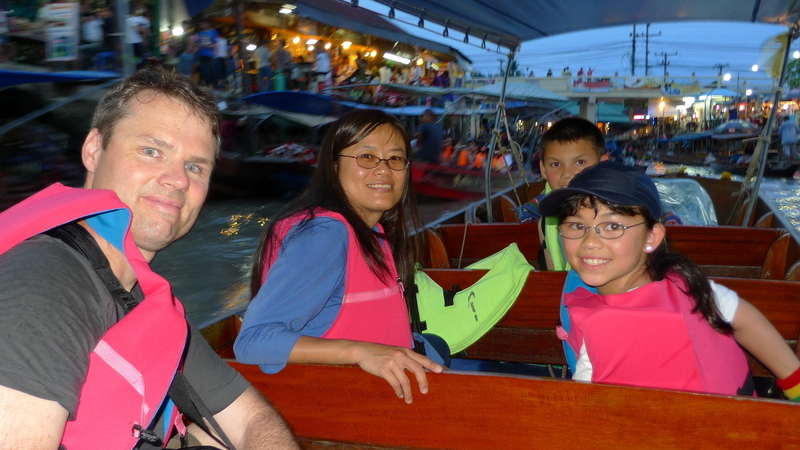 As the sun was setting, we rented a long-tail boat and took a tour along the canals and river for a chance to see what country like along the water looks like. Along the way, we were able to find many trees and bushes along the banks that were full of the fireflies for which this area is famous. Back at the market, everything was bustling as people ate dinner and snacked on local specialties, including grilled prawns and squid that are among the freshest you’ll ever eat. The bulk of day 4’s assignment was to try new fruits, foods, and desserts, of which the market has plenty. We went from vendor to vendor, looking at the many different items for sale, trying to guess what they were, and sampling many of them. 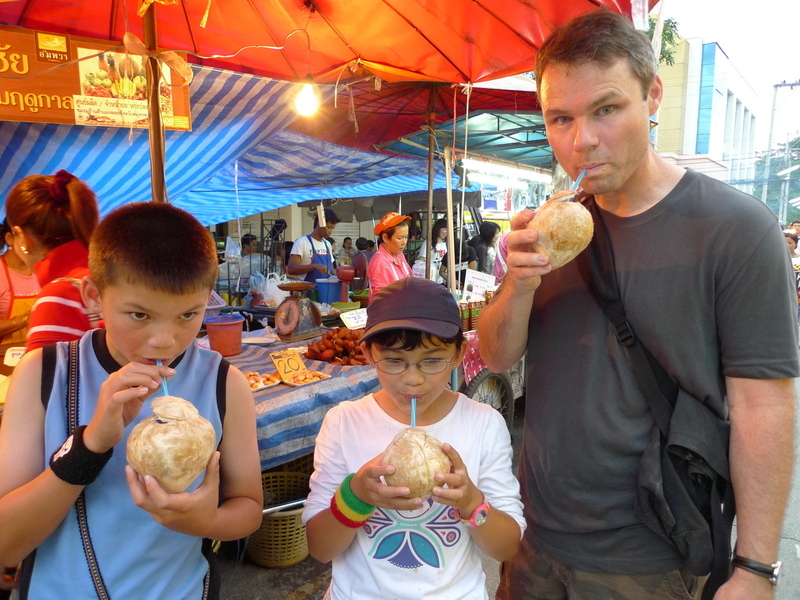 Above, Agents E and C, along with their father, try some fresh young coconuts. Uncle Tawn picked up several types of fruit for them to try. By the end of the evening, the agents had fulfilled their assignment and had tasted (although not always enjoyed) many new edible items. We headed back to Bangkok that evening with full stomachs, heavy eyelids, and many new memories. This entry was posted in Uncategorized and tagged Amphawa, Clevelands, Crocodile, Elephant, Floating Market, Market, Nakhon Pathom, Samphran Elephant Ground, Samut Songkhram, Thailand by christao408. Bookmark the permalink. That looked like so much fun! Especially the elephants (such intelligent creatures). I really enjoyed reading this and almost wished I was a kid again. I think you really sparked their interest and broadened their horizons. Haha~Chris, you will definitely be a very good tour guide. That’s exactly what I did when I first visited Thailand. 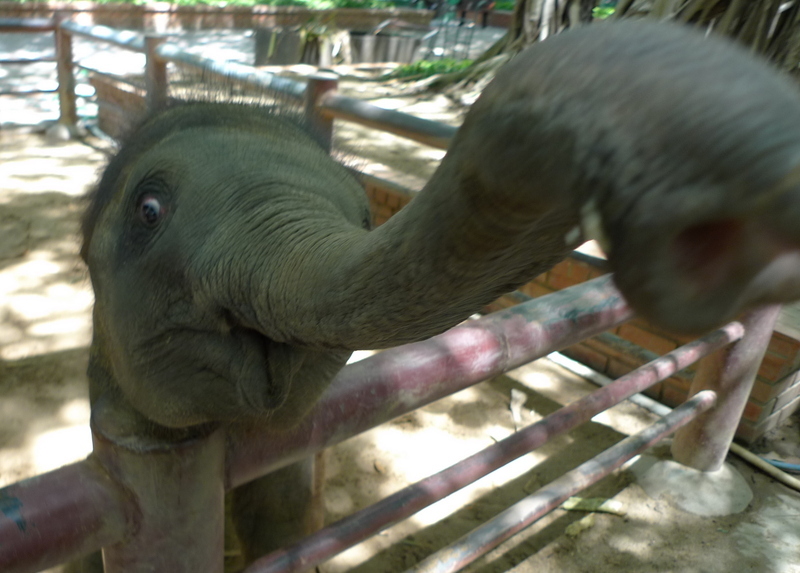 I want to feed those elephants again! You know Chris, I think you have given the ‘agents’ some wonderful experiences which they will cherish for ever! I’m glad I found this blog… I’ve been wracking my brain! Trying to figure out what to do when I head off to Thailand in a couple of months!I can’t wait to scour this blog for go to spots!Thanks! Wow. Looks like a wonderful time! I do wish you had been able to get a photo of the fireflies in the trees… I have to go back and find and read days 1-3! @ikutt – Thanks for stopping by. If you’d like to message me, I have a few documents I’ve created that list recommended to-dos in Bangkok, elsewhere in Thailand, and also a restaurant list. I’d be happy to share them with you. @murisopsis – Sadly, the fire flies aren’t bright enough to get a good picture of. @Dezinerdreams – I hope so, although I think back to trips I took at 8-10 years old and I don’t really have many strong memories, just fleeting ones. @onmovement – As well it should. Don’t try this at home, LOL! 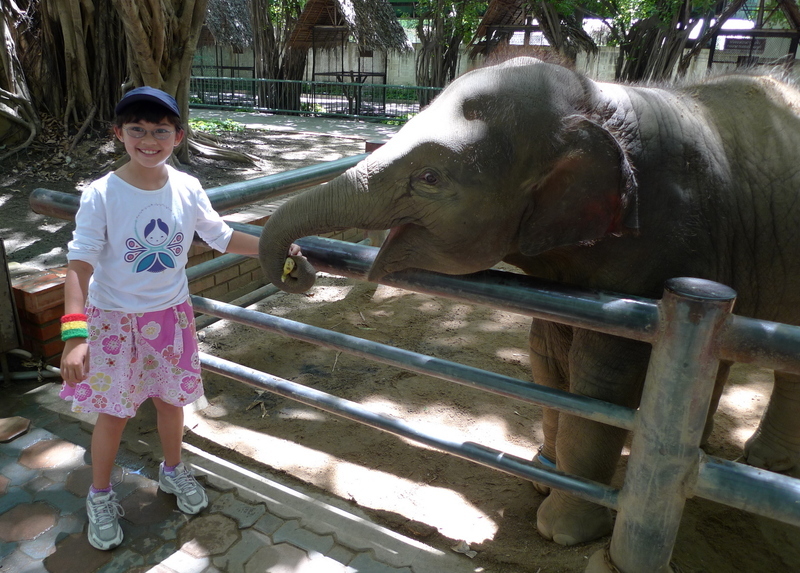 @CurryPuffy – @marc11864 – Seeing the elephants is one of my favorite activities. @ElusiveWords – You still are at heart, though, right? Wow Chris, you really spread the carpet. This was a very good read. In the third picture, I was amazed at the smile in the baby elephant’s eyes, as if it knew that the little girl was having fun. The best tender coconut and its drink I EVER had, was in Bangkok. I cannot describe how cold and sweet it was. In the friut market, the last phot, the ‘seetha phul’ seen at the left elbow of the lady is a fruit, I used to love. OMG, just looking at it now, gives me a pang in my heart. Unfortunately, they also are available only during summer in India!! My luck.Neat post Chris. @Sc12EeN17aM3 – I think the African elephants are bigger in general than the Asian ones. These were also just the females – they didn’t have any males out to interact with, as I think they are used more for the shows. Actually, scratch that – there was one male but he seemed to be only a few years old, so wasn’t really large. @yang1815 – It is. We’ll take you and Sugi here on your eventual visit. @aPieceOfTheSky – How did you like the southern part of Thailand? Despite the separatist violence down there, I’m curious to visit as it is another slice of Thai culture, very different from elsewhere in the country. @ZSA_MD – I’m convinced the elephant did know. They seem to be very tuned-in emotionally and like other animals I think they can sense the emotions of people. As for the fruit, that’s a custard apple, right? That’s what Tawn bought and we need to eat them before they go bad. @christao408 – Can’t wait! 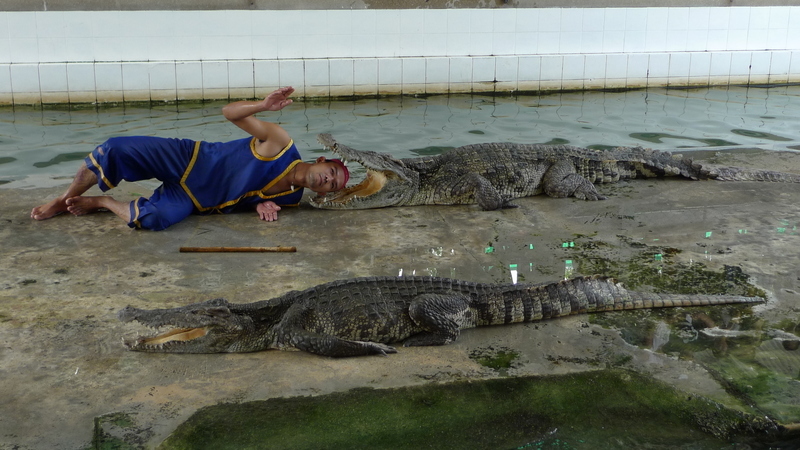 I have been to an elephant zoo place with crocodiles but not sure if that’s the one. @yang1815 – There are several, but this one is the most famous. @aPieceOfTheSky – Sometimes having fewer things to do means more opportunity to just unwind, which sounds like a much-needed thing for me! As for the security checks, those are becoming commonplace here in BKK, too. @TheCheshireGrins – Aren’t they? Oh Wow ! This would have been my favourite part of the holiday. First the elephants. Is that first elephant that they are all standing in front of a ‘real’ one or a very lifelike statue ? Agent E doesn’t look too sure about getting too close, that poor baby is certainly having to stretch for it’s treat ! lol I love the expression on the face of the baby with agent C, it looks so much like it is grinning – what a lovely picture. Was Agent C actually lifted off the ground by the mother ?I love the one of the baby that wanted your camera too LolAnd the one of Tawn with one of the adults. 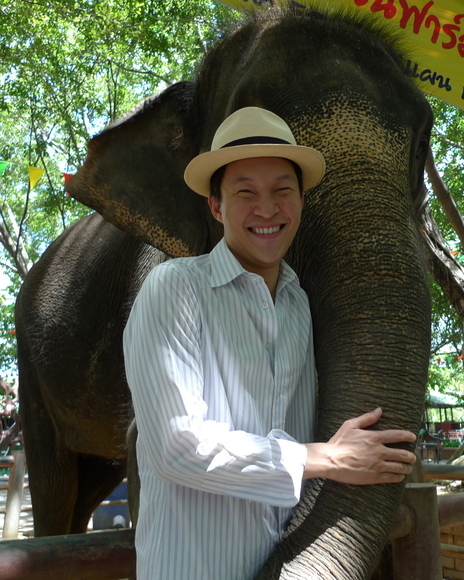 Don’t see a pick of you with any of the elephants though.I would have thoroughly enjoyed myself among those lovely creatures, you’d have had to drag me away from them ! 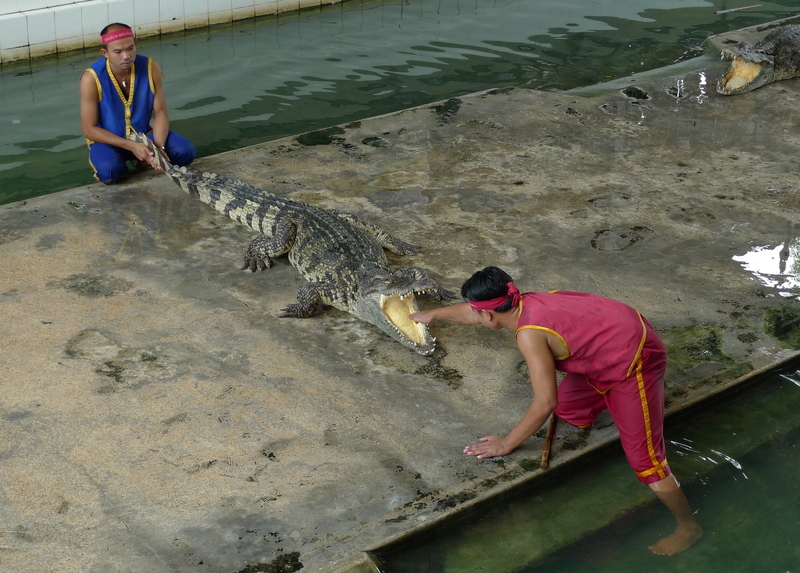 Lol As for those crocs – YIKES ! Just how close is ‘too close’! Presumably they are fed ‘before’ this show is put on LolThe trip along the river looks really interesting too and you finally got a mode of transport that you weren’t packed into like sardines in a tin ! Lol But WOW ! 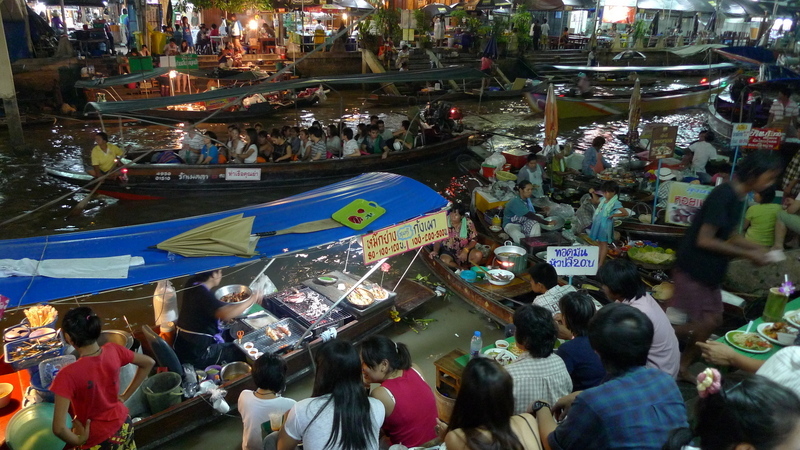 just look at those river banks – all those people and so much going on ! Had me trying to picture our town centre market with a river running right through the middle of it !I’ve really enjoyed reading through this entry and seeing all these lovely pics Chris. 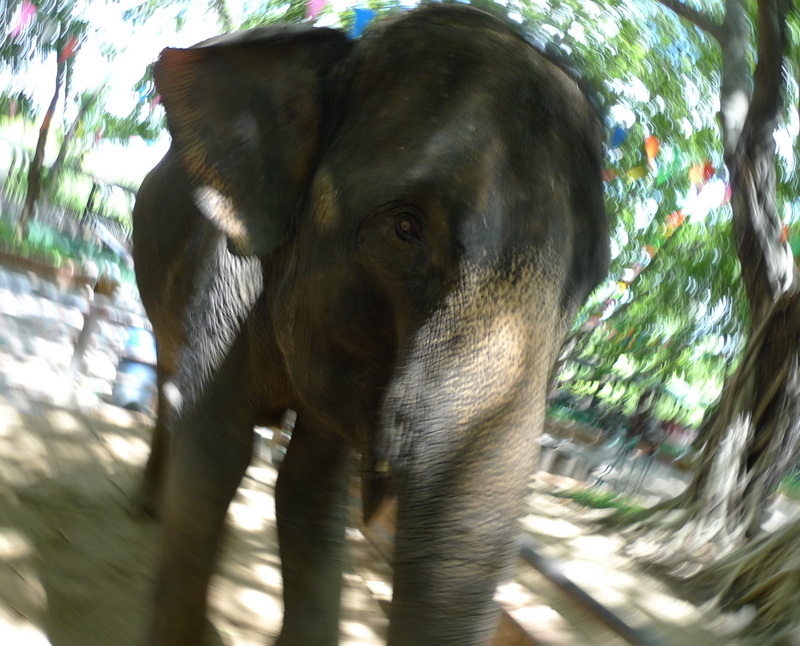 @Chatamanda – The agents definitely weren’t getting too close to the elephants, which made it hard to get good pics. They are really amazing creatures, though, and you could just spend hours with them. They’re so smart!